Gosh, this makes post titles a doddle, doesn't it? The DUCJC is being held this year in memory of SoCal Debbie and I am attempting to stitch on 31 different projects throughout January. A mixture of WIPs and new starts. I stitched the two pumpkins on the bottom left. Giovanna will be SAL with me on this one. One cube per month until Hallowe'en. I emailed Isabella to ask for this chart plus two thread winders for Christmas. Due to a misunderstanding she sent me the Christmas Cubes instead. So what's a girl to do? 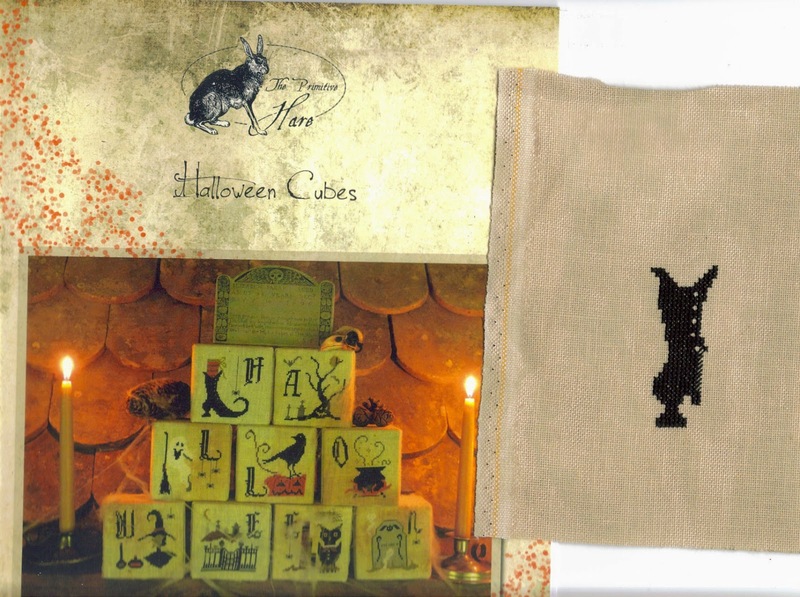 I decided to keep those too, pay for them and ask her to send the Hallowe'en Cubes in addition. As a little "sorry" she invited me to choose one more chart of my choice! I loved the design Gracie had stitched for the Christmas competition so chose "Dear Santa, define Good". My previous post was the link-up for the Gifted Gorgeousness SAL. I have now visited and commented on every blog who linked up so far. The link-up will stay there so please feel free to join in any time this month. There has been some great stitching going on, lots of lovely gifted charts and fabrics plus a good few shoehorns too! Finally, I will be running the Secret Stitching Sweetheart Blog Hop on Valentine's Day. It's really very simple, all you have to do is email me a picture of something you have stitched which is suitable for a stitching friend on Valentine's Day. It could be a heart, or a pair of cute creatures, or the word "love" or anything which warms your heart. Really anything you think a fellow stitcher would like to receive in her email Inbox. It can be something you've stitched in the past or something you've made especially for this year. It could also be quilted or sewn this year as I know some of my followers do other crafts too. Send me the email by 10th February. Does that make sense to everyone? I hope so! If you'd like to be involved then leave a comment on this post, I'll be putting little reminders up from time to time and will email on 9th February to make sure you send the pic in time. Beautiful starts! I love the Joan Elliott patterns. I hope to do all of them someday. Your fabric choices are wonderful. Especially the chocolate orange. If it looks half as amazing in person as it does in the photo I may need to find something to stitch on it. Lol. Nice progress on the pumpkins Jo. I love your new starts. That chocolate orange fabric is gorgeous. I'm with you.... great post titles!! Beautiful projects...Belive is really pretty, but so are the others! 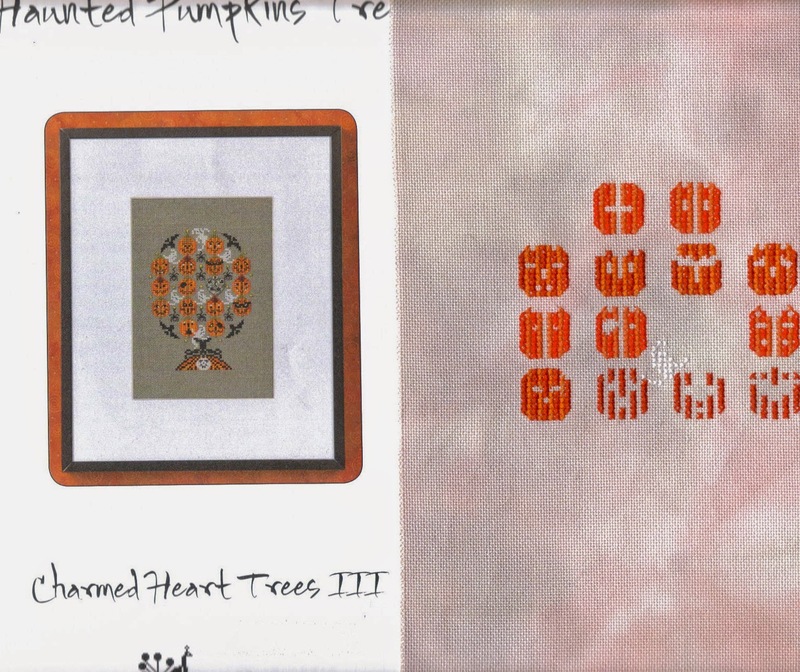 "Haunted Pumpkins Tree" is amazing! Gorgeous stitching! I love the Primitive Hare and the Joan Elliott ones in particular! Love all the news starts and WIPs. I normally don't like Primitive Hare patterns (just not my thing) but wow these are a cute idea. I look forward to watching your progress. Great new starts. I especially love all of the Primitive Hare designs. The pumpkins are a fun design. Lots of lovely things you've been working on Jo. Love all the starts, especially the Believe. Lovely! Can't wait to join in! Is there a picture I can put up on my blog for this? Please count me in, Jo. Plus more gorgeous starts for DUCJC2015. Valentine blog hop is back, great. I'm mailing a pic today to join the group. Love reading about all your January starts - they feature lots of my favourite designers so watching progress through the year will be great. I'm another big fan of The Crafty Kitten - I was lucky enough to be given a year's subscription to one of her Fabric of the Month clubs so my stash of hand dyed fabrics will be growing this year without any cost to me. I would love to join the Valentine blog hop but need a bit of time to decide on what to send you. Found something to fit in with the Valentine blog hop, so count me in please.